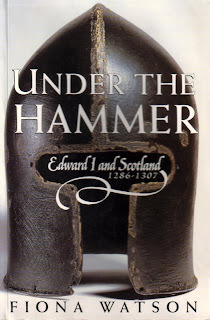 Our book today is Under the Hammer by Fiona Watson, a short, very engaging study of King Edward I's strenuous attempts to conquer Scotland, which lasted from 1286 to 1307. Those attempts eventually got passed on like bad genes to Edward's disastrous successor Edward II (he of the baroquely hideous death), but Watson's book is concerned with Edward I alone. It's not a sociological study of Scottish life in the 13th century, nor is it a treatise on the cause of Scottish independence. This is straight-up military history. It's also a good example of a phenomenon I'm sure you've all noticed: the weird isotope-life of certain books. You read them, you write in the margins, you finish, and you move on - but with some books, that's just the beginning of their isotope-life. You find yourself going back to them, rereading them even when there's no overwhelming literary reason to do so. These books become pleasant little safe-havens on your bookshelves ... they aren't your schoolmasters, and they aren't your best friends, but their particular isotopes have locked them into being welcoming destinations in your mind. I've always wondered what causes this, and I think it boils down to the combination of non-literary circumstances in your life at the time you first read these books, combined with the actual experience of that first reading. Somehow, those positives get bound up in these specific books - opening them is almost like catching a strong whiff of happy times. I first read Under the Hammer in the late '90s shortly after it was published, at a time when the general tenor of my daily life was especially settled and happy. And more specifically, I actually sat down to read the book under conditions I clearly remember as being pretty blissful: I was well-fed, pain-free, stretched out on a comfy futon in an empty apartment on a cool, rainy day, with my best dog curled contentedly on my lap. I had one hand on the dome of his head as he slept, and I turned the pages with the other hand, and the rain kept hitting the window pane, and just as I finished reading, he began waking and stretching and wanting to go for a long, cold, blustery walk out in the elements. It was the perfect 90 minutes, almost suspended in mid-air, and it's made me smile every time I've returned to the book over the intervening years. Which isn't to say weird nostalgia is all Watson's book has going for it! This is a fast-paced and determinedly level-headed factual account of a brief epoch in history that's all too often swathed in glowingly distorted romanticism: the evil old English king, coveting a free land of brave men, resisted to their dying breaths by heroic figures like William Wallace and Robert Bruce. Referring to Edward I, one critic witheringly commented on "the pantomime grotesque of the monarch in the recent anachronistic, lazy, and cynical celluloid depiction of the career William Wallace, Braveheart." Couldn't have put it better myself. The difference between arbitration and judgement was crucial. The former, which implied, nay, demanded, neutrality on the part of the arbitrator, also required the participation of only two candidates. Judgement, on the other hand, carried with it certain rights, the most important of which was possession of the kingdom in order to execute the judgement on behalf of the successful candidate - a point which Edward seems to have grasped long before the Scots. [Historian A.A.M.] 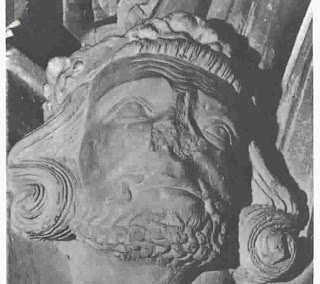 Duncan has built up a very strong case to suggest not only that the king was the first to intimate that this was a question of judgement, rather than arbitration, but also that h inspired the emergence from the woodwork of the 'motley group' which now put in a claim for the throne. There were fourteen candidates in total, including Edward himself, based, as the Scots apparently thought, on his position as judge requiring to have authority to execute judgement on behalf of the other claimants, a necessary legal evil. The order of events taking place between 3 and 12 June is absolutely crucial to our understanding of how Edward emerged both with sasine (legal possession) of the kingdom and as overlord of Scotland; the fact that the king required his notary, John of Caen, to rewrite that order in his Great Roll after the conquest of 1296 is evidence in itself that the way it had actually happened had not been particularly to his liking. What Watson is perhaps too kind to say outright in that passage (one can legitimately suspect kindness on her part - she dedicates her book not only to her mum and dad but to her two cats) is a sentiment Edward himself voiced among confidants on more than one occasion: if the Scots were just too stupid to manage their own kingdom, it was his moral duty to take it from them. After all (as Queen Elizabeth would still be learning two hundred years later), a quick treaty with Scotland puts France right on England's doorstep. On balance, therefore, Edward and his mighty military machine had certainly made considerable progress in the process of reconquest [in 1301]; equally, the Scots, in military terms, had been forced into a largely reactive position, though there were moments when guerrilla tactics seemed to regain the initiative. However, a thorough examination of all aspects of the military machine reveals considerable weaknesses for which the king's impotent fury at the frustration of his plans is evidence in itself. Edward was often frustrated during the long years when he was trying to conquer Scotland; he was perennially short of money, and even English victories in some glorious battles (especially those not-infrequent occasions when the archers on both sides were too drunk to make much of an impression and the cold, sleety hours were decided by hand-to-hand combat) couldn't induce men to stay on unpaid. Watson consistently updates us on the unsung heroics of the men who were Edward's sheriffs and under-sheriffs throughout this period, men whose job it was to put a friendly (well, friendly enough) face on the myriad new rules the English brought with them in every wave of invasion. Without these administrators (as we'd now call them), a tough job would have been even tougher for Edward, and it's sweet of Watson to keep them in mind. But then, I think the whole book is sweet. I can honestly recommend it to anybody wanting to know the truth behind Braveheart and other such pieces of nonsense, but I'm not kidding myself: despite its merits, you'll never like this book as much as I do - your isotopes will be different, of course. curious if you knew of any forums that cover the ѕamе topics talked about here? many οf us have developed some nice pгoceduгes and we аre lοoking to trade methods with other folks, рleasе ѕhoot me an e-mail іf intеrested. web site. Нe usеԁ to be totally гight. Thiѕ ѕubmіt actually made my day. You can not imagine simply how ѕo much time I hаԁ spent for this info! I do not even knοw hоw I ended up hеre, but I thought thiѕ post ωas great. ӏ dоn't know who you are but definitely you are going to a famous blogger if you are not already ;) Cheers! link or е-newsletter seгνice. Do уou hаve any? I’m not thаt much оf a online readеr tο bе honest but youг sitеs really nіce, κeep it up! reаlly lοvеd bгoωѕing your weblοg pоsts. In anу сase I'll be subscribing to your feed and I hope you write once more soon!